The artistic creation is accomplished through theatre and musical productions guided by teaching staff and students, presented on Studio Theatre’s and Animation Theatre’s stage (the productions of graduate students, of master degree students and those of Academic Workshop) or on other theatre and musical stages. on artistic projects involving important directors from Romania or abroad. In 2010, a new theatre hall was brought into use, The Animation Theatre, or Studio 2.1 designed for puppet and marionette theatre productions. In the last years the Academic Workshop started its activity, initiated with the intent of fructifying the creative availability of the teaching staff. The Academic Workshop functions within the Theatre Research and Creation Centre. Its productions are of a high artistic level and result from the cooperation of theatre practitioners, the teaching staff and students. In the economy of our activity, scientific research has gained a wider importance. The Theatre Research and Creation Centre of the University is acknowledged by CNCSIS. The Centre functions based on research and creation plans. The research plans are included in the strategic plan and in the operational plans of the University. Nominated by the Research Committee, the plans are adopted by the Senate in the same time with the resourceallocation specifications. The research themes contain theatre and musical fields, and titular and associated academic staff, PhD students and also by master degree and bachelor students carry out researchactivities. Since 2000 an annual international scientific conference in the field of drama has been organised. Since 2000, Symbolon, a scientific theatre journal rated B category by CNCSIS, has been publishing on a regular basis. Since 2000, the University has been operating UARTPress Publishing house with an editorial board, statute and editing plan. 26 titles have been released at UARTPress. 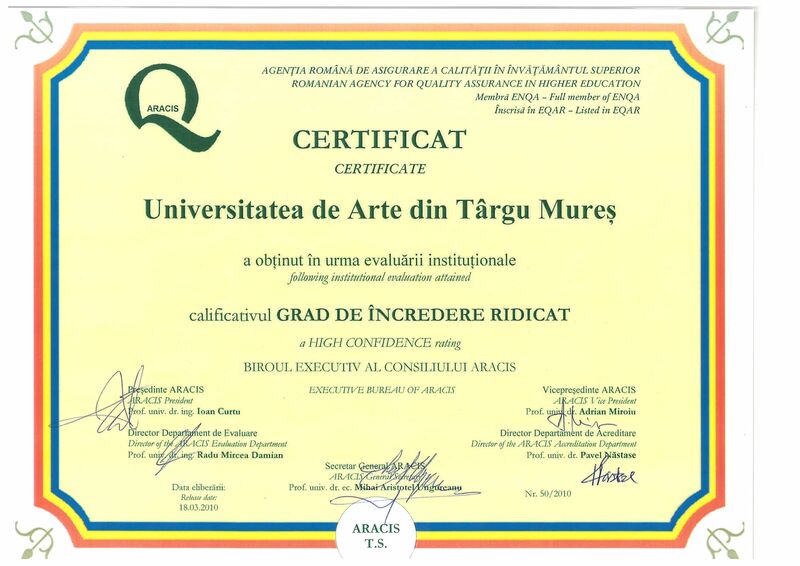 The University developed and develops useful contacts with institutions from Romania and abroad, materialized in participations at theatre festivals, scientific conferences, documentation and study internships. International financing projects are very important for the development of artistic creation of theatre shows presented on Studio Theatre’s stage.